My desire is to create art that speaks to the heart and brings a smile to your face. I am fascinated and delighted when I discover the unexpected in a piece of art. Rock painting enables me to create one-of-a-kind, endearing objects for people of all ages and walks of life from an unexpected material found all around me in southeastern Colorado - rocks and stones. As a believer in simple, natural, economical living, I’m recycling an ordinary item into something extraordinary. Each application of paint brings the rock to life with a one-of-a-kind appearance that becomes a unique conversation piece when used as part of the Christmas nativity scene. Watch this video to see how I transformed rocks and stones into endearing home and garden decor in 2014. Learn more about the art of rock painting on my blog, Painting Rock & Stone Animals, Nativity Sets & More. Painting Rock & Stone Animals, Nativity Sets & More Hand painted rocks - crafts, ideas, and tips to inspire creativity, delight the heart, and bring a smile to your face. You can see my other charming, painted rocks at High Plains Critters and Flickr. 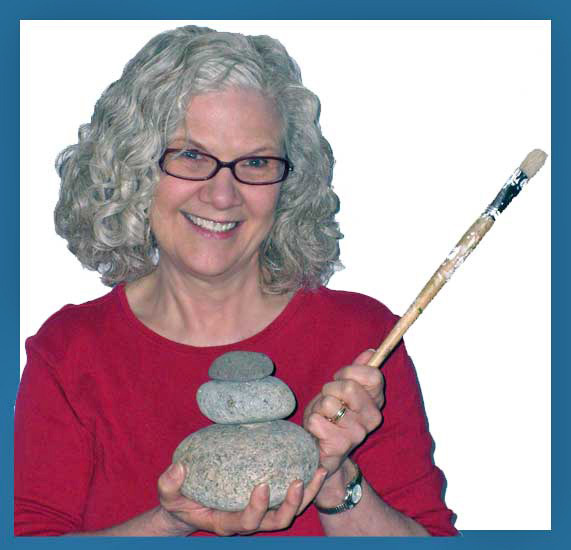 The inspiration for my rock painting was Lin Wellford. DISCLAIMER: I may receive revenues from any product recommendations or ads on this site.